Draft evader, Pauper, Teacher, Zionist, Pioneer. In 1907, a young Russian came to the Galician oil town of Boryslaw to open a Hebrew School. This upset the local Chassidim who saw this young man as an evil influence on their sons and, even worse, their daughters. At the end of the first day of the school, a young woman, much older than the usual students, asked Wolf to give her private lessons, and after some discussion he reluctantly agreed. Later he discovered that she was a daughter of the leader of the Chassidim! 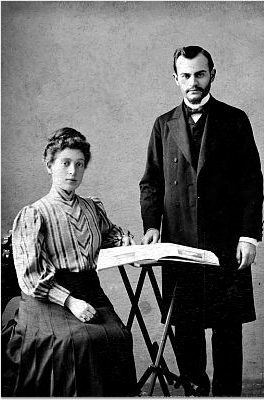 As the photo of that young woman, my great-aunt Blume, and Wolf shows, they married and as ardent Zionists moved to Palestine, followed by most of my family. Join me as I tell Wolf's story as he fled Russia to escape the Tsar's army, on to England and deep poverty, then to Galicia where his fortunes changed and he became a teacher and met 'The Lady Pomeranz'. Then to Ottoman Palestine as part of the Second Aliyah. Based on his autobiography, it's a story that could come from a novel as his and my family's lives intersected major events in Jewish life in the 20th century. David Scriven is a long-time member of the JGSBC and has been doing genealogy since the mid-1990's. He still has a day job as a scientist studying the molecular structure of heart cells at the University of British Columbia. The Jewish Genealogical Society of British Columbia (JGSBC), a non-profit organization, brings together people who are interested in pursuing their Jewish ancestry or family history. Together with the Jewish Museum and Archives of BC we try to restore the history and family links that time has erased. While there are many resources available on the internet, their use does require some skill and training. Many traps await the unwary: name changes, spelling errors, the same name for two different people, the many vagaries of census takers, clerks and other takers of record. The difficult task of digitizing the records has led to other errors creeping in. We will help you to avoid those pitfalls and develop an accurate and descriptive family tree. If you are interested in joining us, you can pay for a yearly membership here. Any questions? – send us an email. This site also has links to resources (including Jewish newspaper archives) that we have found useful in our research.